A relationship often overlooked, Jewish American and African American relations have evolved from good, to bad, to good once more. Several prominent Rabbis were outspoken abolitionists, including August Bondi and Rabbi David Einhorn, and the African American slaves found comfort and solidarity in Jewish culture. Around the turn of the 20th century, African Americans started to migrate North, that European Jews began immigrating to major American cities. Both groups were new to the area, minorities, lower class, and usually discriminated against by white America. And so an alliance was formed. As the World Wars sent more Jews fleeing from Europe, African Americans even began to see their Jewish brethren “some kind of colored-folk”. These relationships were solidified with the advent of the NAACP, which was formed with the help of Julius Rosenthal, Lillian Wald, Rabbi Emil G. Hirsch, and Henry Malkewitz—prominent Jewish leaders of the era. During World War II, Jews and African Americans were working hard to fight for Victory at Home against discrimination. Many of the lawyers sent down South to represent defendants in racism trials were Jewish, and several Jewish lawyers worked on landmark cases, such as Brown vs Board of Education with Thurgood Marshall. 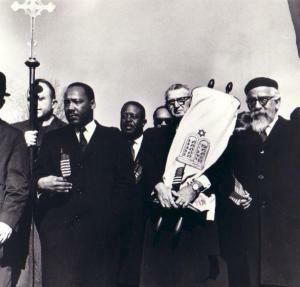 These years of tight cooperation between blacks and Jews is looked on as a “Golden Age” of race relations. However, in the 1960s, and early 70s, the relationship between the two communities started to change. Since the end of WWII there had been a steep decline of Antisemitism. And this coincided with a new Black Power movement, in which some African Americans felt that it was better to be self-determining; nonviolent protests were done, and now it was time for African Americans to attack racism directly, often violently, and Jewish communities were getting caught in the backlash. Jewish Americans started moving out of their old neighborhoods, but kept their properties—so instead of Jews and blacks being neighbors, Jews became the landlords of these old tenements. Jewish Americans, who once had been seen as “colored”, were now grouped in with “White America,” and vilified by African Americans. Relationships continued to get heated when, in 1991 in the Crown Heights a black neighborhood of Brooklyn, a Jewish man hit and killed a young black boy. The fallout was immense: for three days the neighborhood saw some of the most intense race riots of the latter half of the century. African Americans swarmed the neighborhood, culminating in the death of one young Jewish man. The Crown Heights Riots were a terrible incident that brought many anti-Semite, and racial stresses to a head. Throughout the 90s Black, and Jewish leaders traded anti-Semitic and racist remarks, including Nation of Islam’s publication The Secret Relationship between Blacks and Jews, a book about the Jewish involvement in the slave trade, and many inflammatory remarks by Nation of Islam’s leader Reverend Louis Farrakhan. However, today these fissures are well on the mend. In the 2000 election, Rev. Jesse Jackson, and Rabbi Steven Jacobs joined together to urge black and Jewish voters to push for accurate vote counts in Florida. It was largely thanks to the Jewish vote that President Obama was elected, polling at 78% of Jewish voters. These signs of renewed cooperation, are reminiscent of those first days of Jewish and African American teamwork that was so instrumental to change the political landscape of America.